When you take a look at this year’s starting offensive line for Louisiana Tech, one word takes center stage: experience. Veteran presence up and down the line is something head coach Skip Holtz and the Bulldogs have longed for the past few seasons, and it’s finally here. One of the anchors of that offensive line came to Tech from Orange, Texas, in 2015. He was a USA TODAY Sports Freshman All-American in 2016. He is an engineering major who is also an avid hunter and fisherman. Oh, and his preferred mode of transportation around Ruston is via moped. This seemingly eclectic set of traits belong to redshirt junior Ethan Reed. The 6’4”, 295-pound offensive lineman has proven himself as an integral and versatile presence up front as evidenced most last season. In 2017, the Bulldogs were dealt a seemingly unfair number of injuries along the offensive line, forcing Holtz and OL coach Robert McFarland to be creative – mixing and matching the guys that were healthy into various empty spots up front. 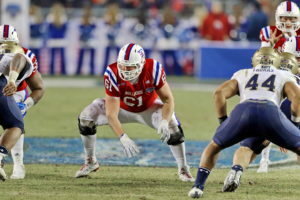 Reed, normally a right guard, saw action at three different OL spots, and helped bridge Tech through eight different starting offensive line combinations, and was ultimately named an All-Conference USA Honorable Mention selection last season. The redshirt junior leads quietly and by example, and goes about his business, starting each of the past 27 games for the Bulldogs. Off the field, Reed says that his heart has always been set on engineering, even from his childhood. When he was narrowing down his choices of colleges to attend, Reed says that a successful culture in the football program, and a rich history of offering the best in science and engineering drew him right here to Ruston. When he’s not on the field, or in the classroom, Reed says without pause that hunting and fishing are his two main hobbies. Saving a little dough is something most everybody can understand, so don’t laugh the next time you see a 6’4”, 295-pounder breezing around campus on a moped. It’s just Ethan – either on his way to design something new, or setting a presence on the gridiron – both of which, he’s pretty successful at doing.